Euthanasia Legalization is a danger to everyone. it is only an additional small step (using legalized euthanasia) to have people captured in the street and killed against their will. Legalized Euthanasia also open up a possibility of Underworld requesting their debtors to volunteer for euthenasia if they cannot pay back their debts. How can the authority stop that? Do you think that gambling addicted rising film stars in Hong Kong had commited suicides on their own? #Mì Vịt Tiềm, #Stewed Fried duck, #Noodle Soup, #Dioscorea hamiltonii, #Hoài sơn, #Papaya, #borax, #han the, #monosodium gluamate. Herbal Noodle Soup of Stewed, Fried Duck (Mì Vịt Tiềm) originated from Cantonese or Hakka recipes. It is a delicious, tasty, nutritious, slightly odoured dish and is well liked in Saigon. 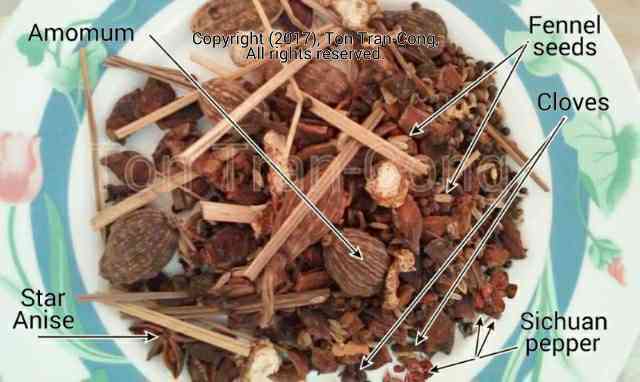 It is claimed to bring some medicinal benefits and is of higher price than other dishes of ordinary noodle soups. Figure: Herbal Noodle with Stewed, Fried/Roasted Duck (Mì Vịt Tiềm) in 300 ml bowl. Herbal Noodle Soup of Fried/Roated Duck (Mì Vịt Tiềm) is usually served wirh 2 accompanying dishes of Fried Prown Pancake and Crunchy Pickled Slices of Papaya. Dioscorea hamiltonii in this soup is a a white traditional and Chinese medicinal herb claimed to be good (?) for treating diabet. 3. About 2hr after eating this dish, your body may have some odour of the dish! This is easily noticeable from the odour of your urine. 5. The pickled crunchy sliced papaya in the accompanying dish (the small dish with yellow slices) may have been made crunchy by immersion in a borax solution (do not eat the dish of sliced papaya if you think that Borax has been used.). Figure: Herbal Noodle with Stewed, Fried/Roasted Duck (Mì Vịt Tiềm) from Melbourne, Australia. This is not a recipe for preparing the dish, it only tells what may have been involved. Half a duck is first marinated in some black soy sauce and ginger then fried. It is then stewed (slow cooked) in a herbal soup. The herbal soup has 15g of Shiitake (a type of delicious mushroom), 20g of dried Hoài Sơn (Củ mài = Dioscorea hamiltonii), a white traditional and Chinese medicinal(?) root tuber [1,2,3,4], 10g of Dan Sam (Dangshen = Codonopsis pilosula, dried root), 15g of lotus seeds, 10g of Chinese plums and 10g of longans. It may also contain Five Spices (commonly a mixture of 1.star anise, 2.amomum, 3.cloves, 4.Sichuan pepper, 5.fennel seeds, 6.liquorice(? ), and 7.Chinese cinnamon(?)). The soup is finally served with the half duck. The half duck soup is served with egg-noodle, Chinese pukchoy, shiitake and longan in the bowl. Hoai Son is claimed to have antidiabetic property (scientific proof is required). The Crunchy Papaya is usually prepared by immersing slices of papaya in Borax water for days. I would not eat the so prepared papaya due to the use of Borax. Cooks using non-authentic recipes may put in a lot of monosodium glutamate to fool customers. Traditional, authentic recipes have no such modern ingredient. In the short term, monosodium glutamate may cause extreme headache, throat congestion, prolonged thirst and swelling of your ankles and feet. Do not eat any non-authentic dish prepared with such ingredient. Borax is banned as a food ingredient. Borax is mainly used as a Welding Flux (for goldsmith welding and for industrial brazing using Acetylene-Oxygen Gas Torches), in Photochemistry (as a Stopper Solution), in Pest Control (the mixture of Borax and Icing Sugar is an Ant Poison). Its Vietnamese name is Hàn The (Hàn=for welding, The=sour taste). The various unpleasant consequences of a Real Estate Bubble. The economy is just like a circulation through these various interdependent industries. Just a single restriction in any one of them will certainly slow down the circulation and will cause problems in all others. The aim of any government is to have all these industries operating at compatible paces so that none will be starved of its required resources. A Real Estate Bubble occurs when people in the economy pledge too much of their resources (current possession and future earning) into their housing, denying resources to all other needs. This disrupts the economy hence weakens employment, making most of the pledge from those people untenable. A person pledge to pay 90% of his future income into his housing will have no money for transportation and food, therefore he cannot keep his job and his pledge becomes untenable. 1. The underlying cause of Real Estate bubbles. a. Buying a house involves a large amount of money that is hard to compare to daily experience of new buyers. New buyers are thus susceptible to sale pitches by speculators. b. Speculators claiming shortage of land due to population growth, neglecting all other factors such as population control, population aging, emigration, outmoded economy, innovation, restructuring of the economy. c. Speculators/developers giving overstretched, optimistic prediction on the utility of some sites to inflate their values. For example, speculators may claim a deserted intersection to become a future traffic hub or the center of a new city to sell its surrounding sites to uninformed buyers. On a larger scale, even Australia had been predicted (in 1990) by speculators to become the Financial Hub of rising Asian economies! It looks hilarious now but people did talk about that with straight faces before the Asian Financial Crisis of 1990. 2. Good time when the bubble grows and terrible time when reality returns. Every property owner feels good when the bubble grows. They feel clever. The ratios of their investment debts to their total assets are becoming smaller and smaller as the months come. Their happiness, wealthy feeling and the increased spending spread to people around them, strengthening the economy. Due to higher prices of properties, the construction industry can operate at full speed, building new houses everywhere, leading to increased demands for cars and other consumer goods. Local governments with taxing authorities increase their tax revenues and embark on their grandiose schemes. Related industries subsequently grow but even then their rises still cannot create adequate numbers of newly affluent buyers for the overpriced houses. The growth of all industries still cannot catch up with the sudden rise in house prices. This INABILITY TO CATCH UP causes the resulting bursting of the price bubble. When prices come back to reality, recent or late property investors worry about the ratios of their investment debts to their assets growing bigger with time. The debts may become unserviceable. Property investors therefore reduces their spending, effecting the economy. A recession of the economy is now a reality. Property Developers not able to sell their products at anticipated prices, while having to pay their contractors and interests on their business loans may be forced to liquidate their unsold stocks (houses). Optimistic housing investors cannot rent out newly acquired houses may have to resell them to cut losses. These releases of houses on the market may cause some panic and amplify the price drops. People then try to cut their losses and reduce their spending. Banks worry about bad loans and may increase interest rates to cover for any possible loss. Many (mostly new) businesses (without deep pockets) will come under interest rate pressure and may go bankrupt. 3. A few foolish buyers will be on their own. When only a few people paid too much for some Real Estate properties, they will be left to solve the problems on their own. They may have to change their life plans or declare themselves bankrupt (depending on the custom and laws of their country). 4. A high proportion of tax payers buying overpriced/oversized properties may force the government into rescuing them. If too many tax paying, productive members of society have over-commited their future incomes on housing and Real Estate, usually the government will move in to slow down their purchases and make new laws to reduce speculators’ profit on reselling Real Estate with the aim of decelerating the growth of any Real Estate Bubble. 5. Any government can decelerate the growth of any Real Estate Bubble. Any government can easily prevent the growth of any Real Estate Bubble with a number of actions. a. The government may make transparent its town planning and acquisition compensation policies. This reduces site selection risk for its citizens and also widens their selectability of housing sites. b. The government may increase central bank’s interest rate on housing loans to reduce availability of borrowed money feeding the Real Estate Bubble. c. The government may impose some capital gain tax on property held only for short periods. It can also ACCELERATE ITS INFLATION to cause big, artificial capital gains on every change of ownership of a Real Estate and (unfairly or fairly) tax that artificial capital gain. d. The government may build decentralized public housings to increase the number of affordable housings as well as improve transport system to reduce the need for “central living” close to city centers. 6. Inaction by a government may allow unfolding of unpleasant consequences. If a government decides to profit from a Real Estate Bubble it will have to face the risk of having its general economy collapsing due to misallocation of resources. a. The new buyers of Real Estate may go bankrupt, unable to keep their pledges to their lender banks. b. The new owners of rental properties may require sky high rents to recover from their excessive purchase price. Tenants may decide to change their life style (accepting longer drives to work, not working in the city,…). This may cause too much vacancy on rental markets, causing bankruptcy of rental property owners and house construction companies. c. Bankruptcy of rental property owners may cause forced sales of their rental properties, lowering their prices suddenly, causing lenders to review loans to rental property owners, and forcing additional owners to sell their properties in an already depressed market, this may cause even further fall in Real Estate prices. The bursting of the bubble may be more severe. e. The bankruptcy of those rental properties investors may lead to the bankruptcy of their lenders. The bankruptcy of Tricontinental in Geelong led to the insolvency of State Bank of Victoria and after that, Victoria State Premier Jeff Kenneth had to impose some once only property levy and one year petrol levy to stop the contagion of the crisis to the whole economy . The development of a luxury brand new suburb with yatch docks in Melbourne nearly destroyed the lending bank Westpac (Australia) . f. Insolvency of one single bank may make bank depositors withdrawing their money from all banks. This leads to the reversion to an all cash economy, upsetting many industries. g. High inflation may then reduce trust on cash, forcing a gold or commodity based economy. h. An economic recession may occur. For the above possible consequences, the government may acts, bringing totally different consequences, which may or may not be any better. 7. Government fulfilling the overstretched projection by developers! The government may also avoid the sudden collapse of RE properties by fulfilling the overstretched prediction of speculators! a. It may create unnecessary shortage of land by IMPORTING VERY HIGH NUMBER OF IMMIGRANTS, irrespective of their prospects of integration and prospective contributions to the well being of existing citizens. (The flood of immigrants is pushing up Real Estate prices in London (Londonmabad? ), Sydney, Melbourne of Australia, Vancouver of Canada as it has done in the past to Gold Coast of Australia (in 1970). b. It may follow wild development ideas by speculators to create new towns where they are not really needed (The Vietnamese government’s plan (2015) to build an International Airport in Long Thanh, to push up land price in that area). c. It may allow foreigners to buy RE Properties to prop up their prices. d. It may print more money to SUPPORT the Real Estate Market. e. The government may print more money to SUPPORT the BANKS. The government may lend banks so much money that they remain solvent but cannot pay the interest on those huge loans. So central bank interests remain low for subsequent decades (Japan has low interest rates for decades after the Asian Financial Crisis). f. It may indirectly give money to the banks by buying back unmatured bonds held by banks at face value! This is called QUANTITATIVE EASING. An economy and its government may enjoy receiving stamp duties, capital gain taxes while the bubble grows but when Real Estate prices start coming to its sustainable level there will be unpleasant consequences. The latter far outweigh the benefits received when the bubble grew.